More and more people are wanting to raise chickens ~ for some people as a means to provide income, and for others just to enjoy them and have fresh eggs. But no matter where you raise them, whether you are in a suburban neighborhood or in a rural landscape, predators will be present. That is why ELECTRIC NETTING is a great resource. The following information is shared by Wellscroft Fencing in New Hampshire. 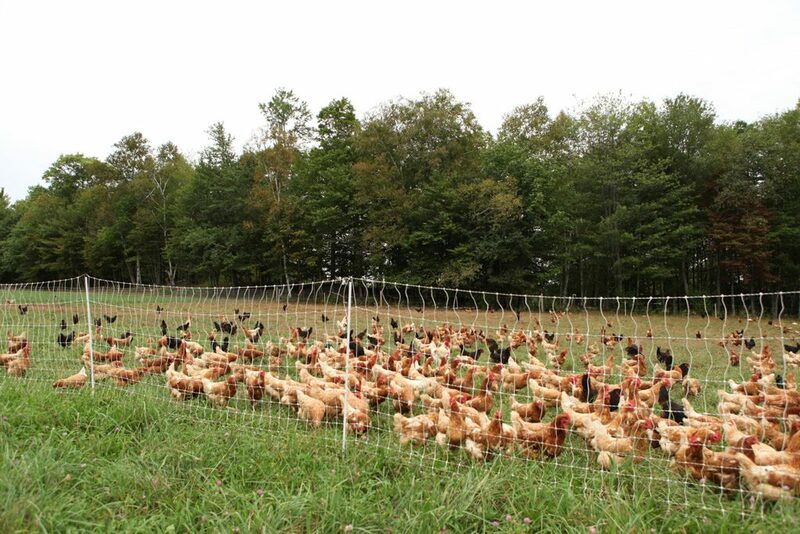 They have personal experience with what they are sharing here ~ they are farmers, too..
Electric netting is one of the fastest, easiest, and most versatile types of fence available. It is widely used to confine just about any livestock as well as protect a vast array of crops from a host of predators. Netting is a great temporary fencing option and is an excellent choice for anyone farming on rented land, preferring to shift their grazing areas, or that does not want to invest in a permanent fence. How electric netting works: One of the nicest benefits of electric netting is it is quick and easy to set up and move. Most netting is made from a poli-conductor horizontal strand tied or bonded to a polyethylene string or plastic vertical strut which holds each intersection in place. A hollow PVC post with steel spike is inserted at various intervals in the net depending on its type (some are spaced closer together to better support the weight of the netting). The size of the netting grid, height, length, type of conductor, post size, and spike type are all considered for the animal that is to be kept in or out. Once you set up your netting, install a ground rod and energizer for it to be effective. It is recommended that netting never be left unenergized. Finally, know that netting is very effective for all seasons, except in areas where winter brings plenty of snow. Netting does not hold up to snow, and wildlife standing on that snow will not receive an electrical shock, as they cannot be grounded. If any of your farm animals are out in the winter, you must use a woven wire fence, with an electrified wire at the top of the fence. In this instance, as the wildlife climb the fence to get over, they will be grounded when they touch the electrified wire. For those of you who live in northern New England, this Free Workshop will be a great learning experience, and you will get to meet other farmers, and share experiences with them. Save May 7 or 8! See link below for details. I was asked recently for advice on handling a “weekend farmer” neighbor who was losing chickens to a fox–mainly because of poor fencing–and whose response was to pick up his gun and go after the predator. Neighbors can be our biggest asset or greatest curse, often how we communicate with them has everything to do with it. I have found it very important to keep a good relationship with my neighbors even if it is me doing all the work in the relationship. Does the neighbor close the chickens in at night? I have found this to be one of the biggest helps as far as predation of chickens. A chicken coop without any holes will keep the girls secure at night, it also goes a long way to allowing you to get a better sleep since you are not up worrying about it. Electronet fencing is certainly the best deterrent we have found at keeping the girls safe during the day but at night we always put all poultry in the coop. Putting the chickens in the coop is not a new thing, folks have been doing this for hundreds of years, if this is the scenario the neighbor is in I would bring it up. It is always easy to say “I was talking to this guy that was having the same problem you are and he said…”. You can also mention the effectiveness of elecro-net fencing. The company Premier One sells a lot of the stuff because it works, they have a good web site that answers most any question one might have. We use it for our sheep as well as the chickens and are very happy with it. Another point you can work into the conversation is that your field, and all the mice and voles it supports is a huge attractant to fox and coyotes. Mention to him that there will most likely always be some sort of carnivore in your neighborhood since the rodents are such a good food source, if he really wants to keep his chickens safe he will need to outsmart the fox.